Two tennis balls are twice the fun! 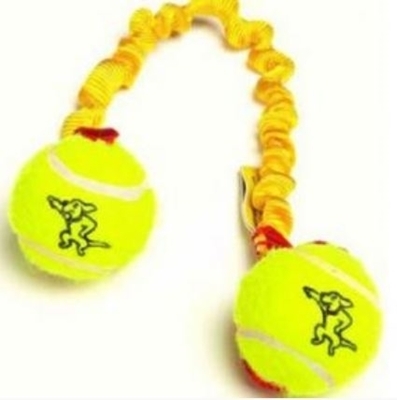 This Stretchy, bouncy tennis ball dog toy has a standard sized tennis ball or you can purchase mini tennis balls which are on each end. The unpredictable bouncing drives dogs crazy. This tennis ball dog toy has an elastic core and a soft nylon webbing exterior for strength and durability. 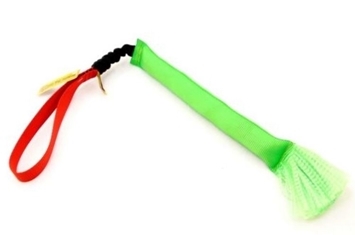 Bunched up, the toy is about 23" long, and stretched, it's over 36". It's a great size for large dogs. 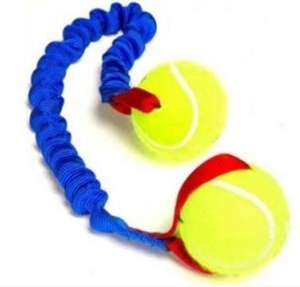 This tennis ball dog toy is also great for two dogs to play with together. Available in assorted colors- Please let us choose the colors for you!